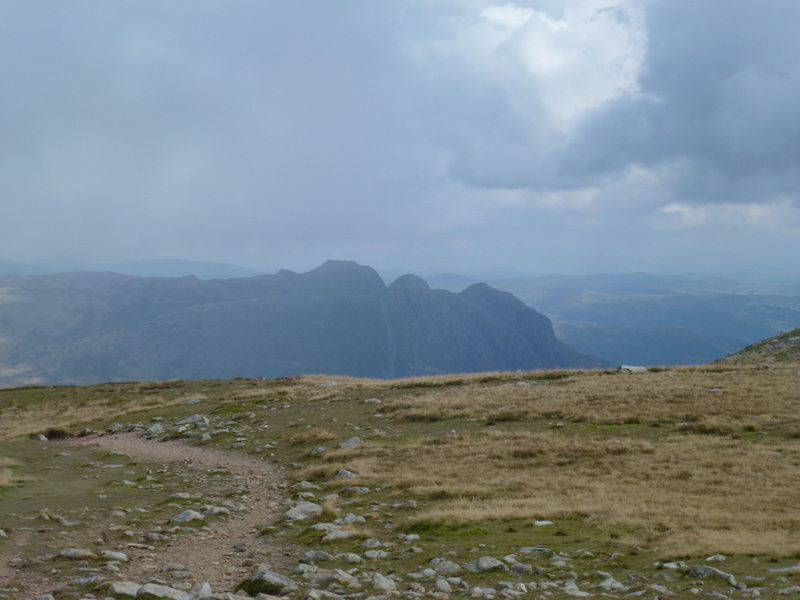 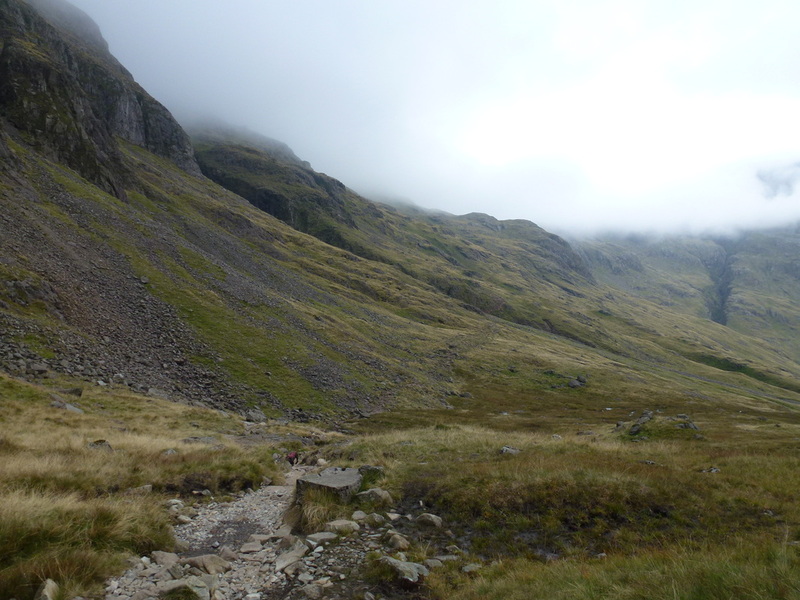 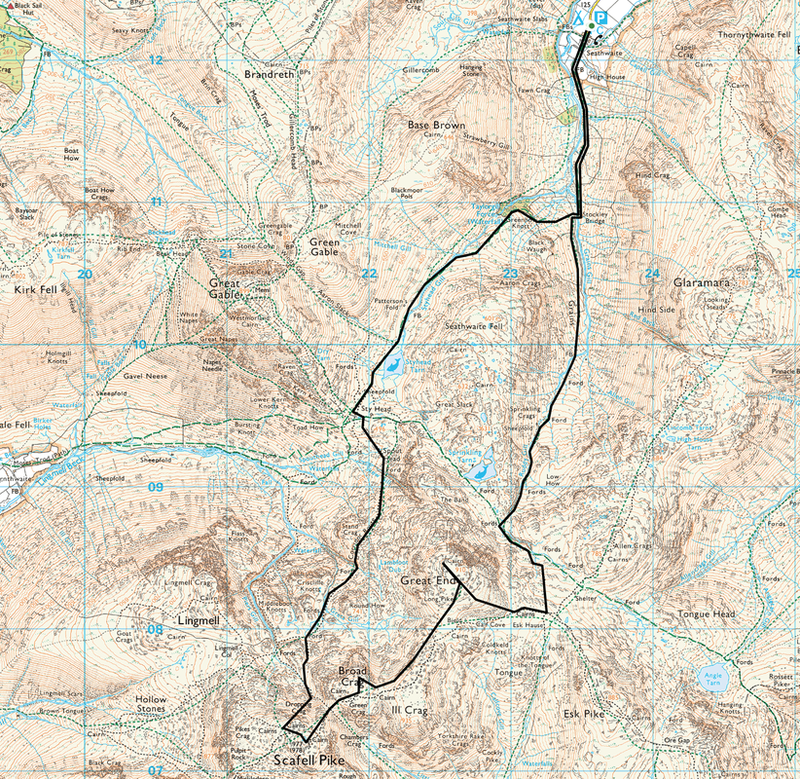 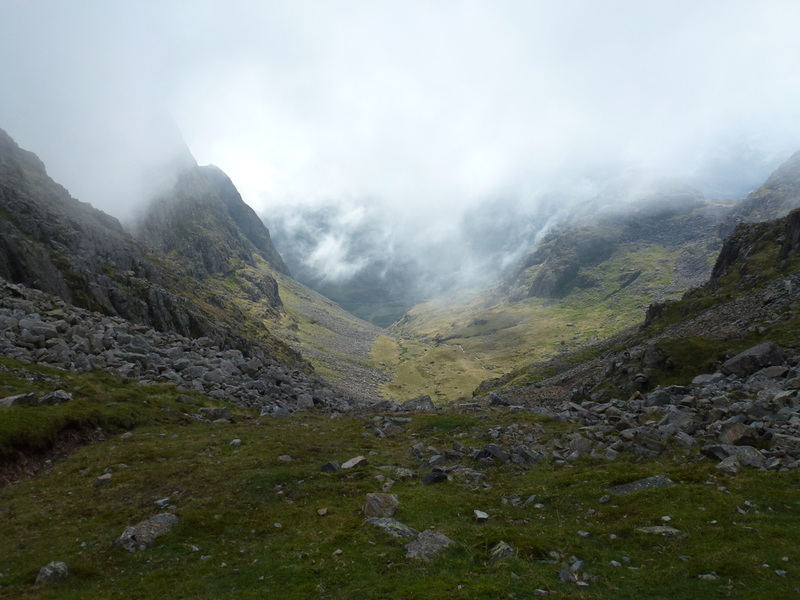 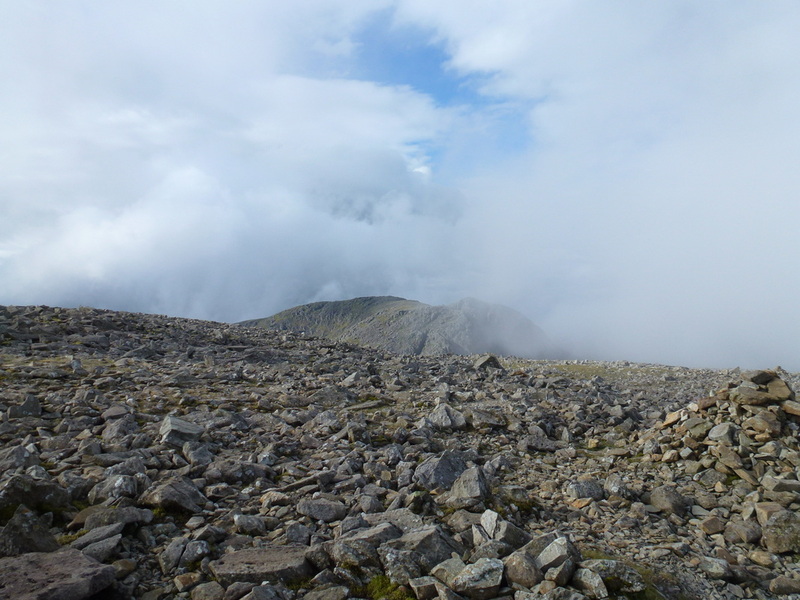 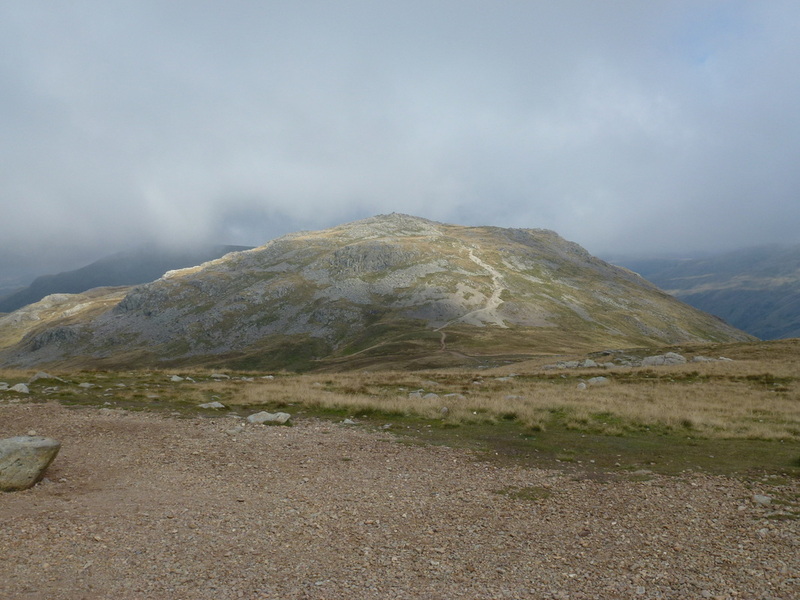 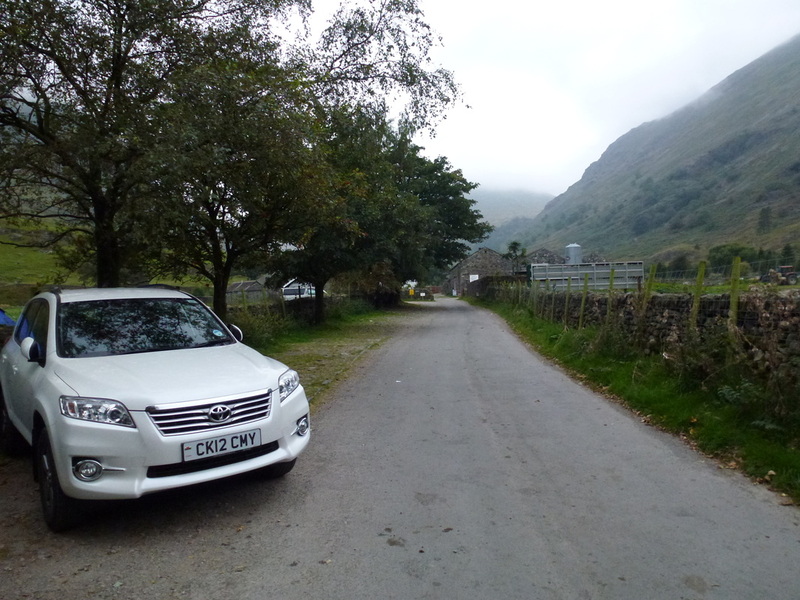 Good mountain paths throughout although Lingmell Col can be very confusing in mist. 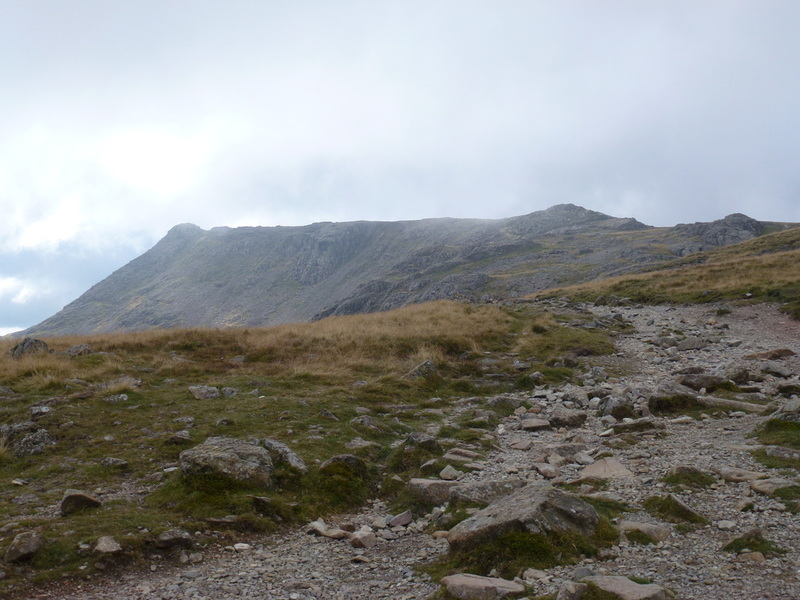 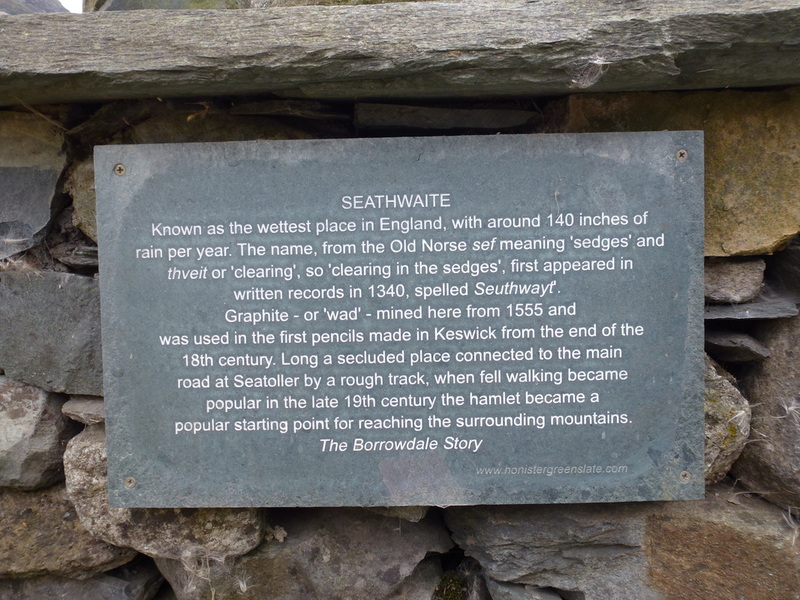 Care needs to be taken on the steep descent to Broad Crag Col.
Up nice and early to try and get up Scafell Pike and Great End before the crowds, therefore we set off from Seathwaite Farm just before 0730. 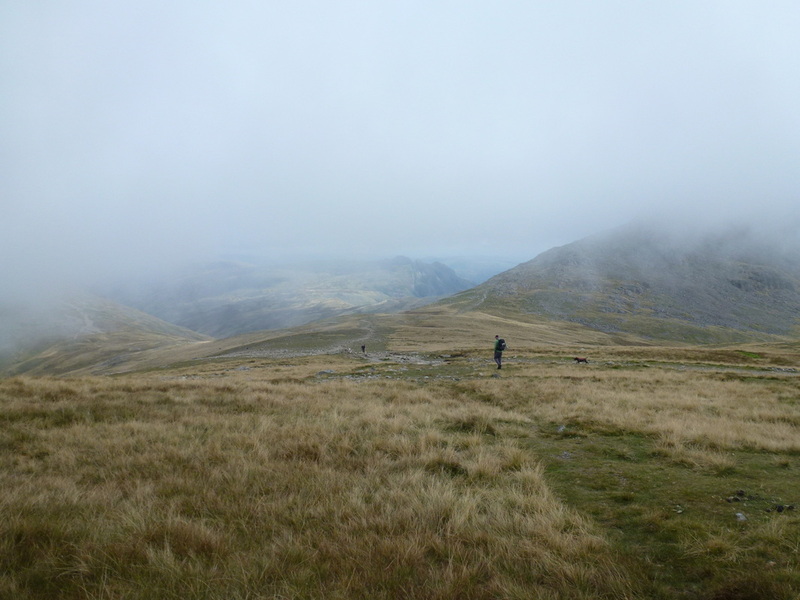 Unfortunately the weather did not look too promising, despite a reasonable forecast, with low cloud sitting below the summits. 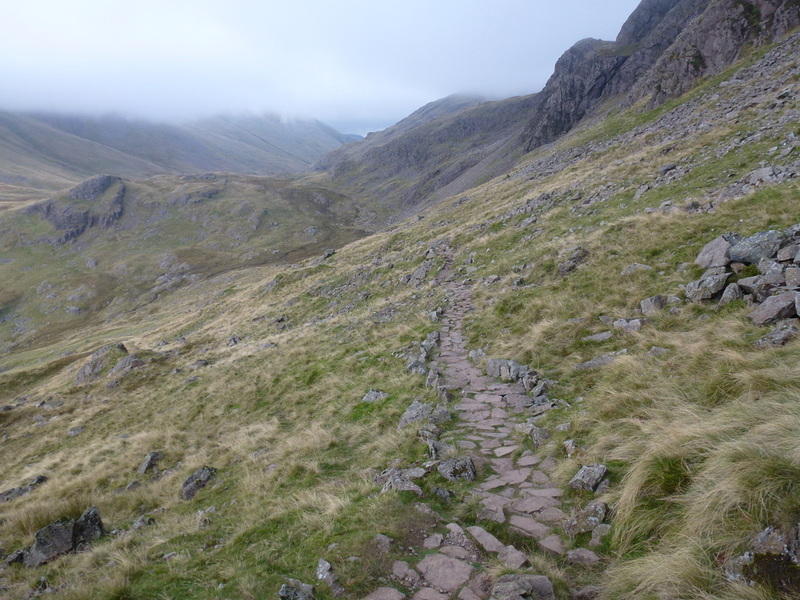 Undeterred, we carried on along the good path towards Stockley Bridge - there was nobody else about. 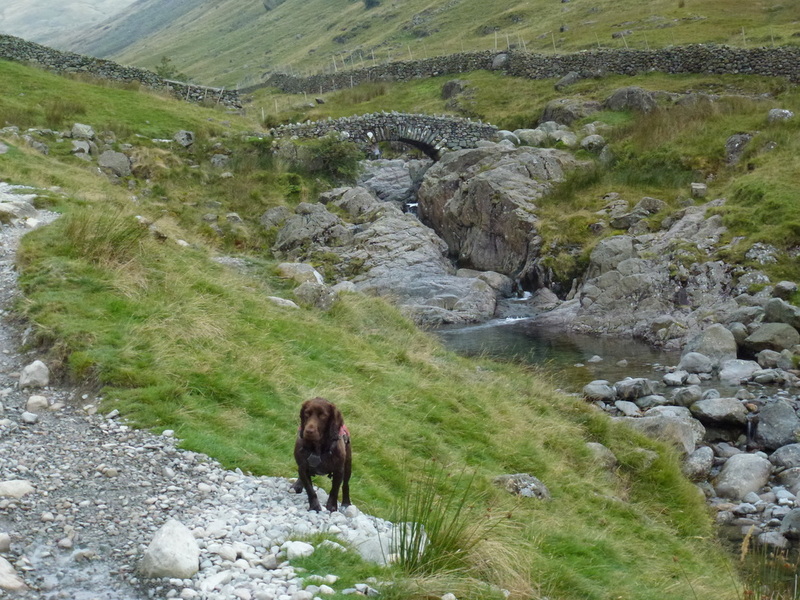 Passing Stockley Bridge, we took the popular path following the gill up to Sty Head - we were on this path a few months ago as it is one of the routes up Seathwaite Fell. 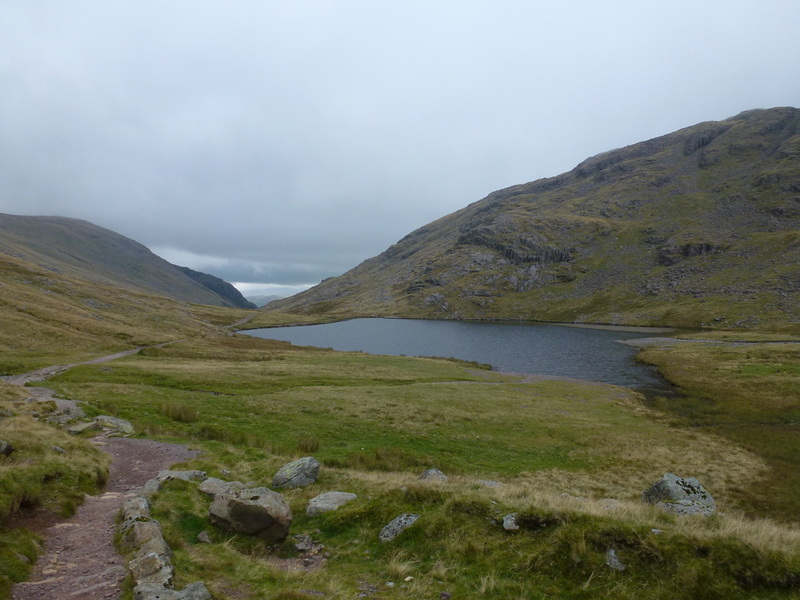 The path makes its way gently up to Sty Head Tarn and from here we walked around to the back of the tarn to search out the Corridor Route path. 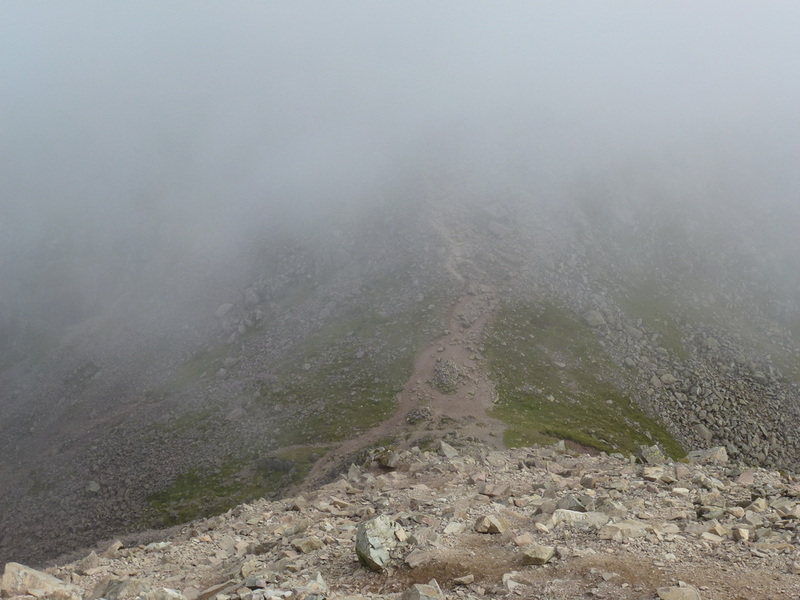 The Corridor is one of the more popular routes up to the summit of Scafell Pike but was quiet today - we saw one person coming down from Lingmell Col and that was it. 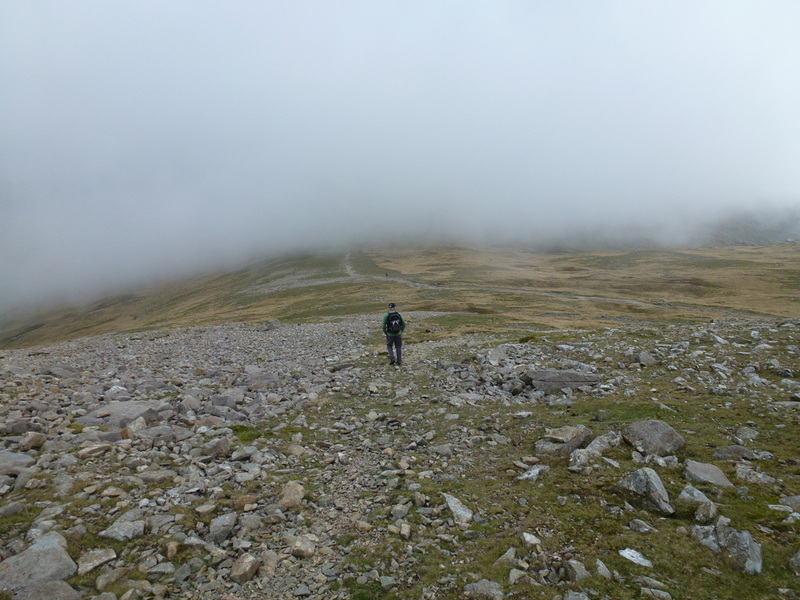 On reaching Lingmell Col the visibility was still pretty dire therefore it took a fair bit of navigating from both GPS and compass in order to make sure we took the right path up to the top of the Pike. 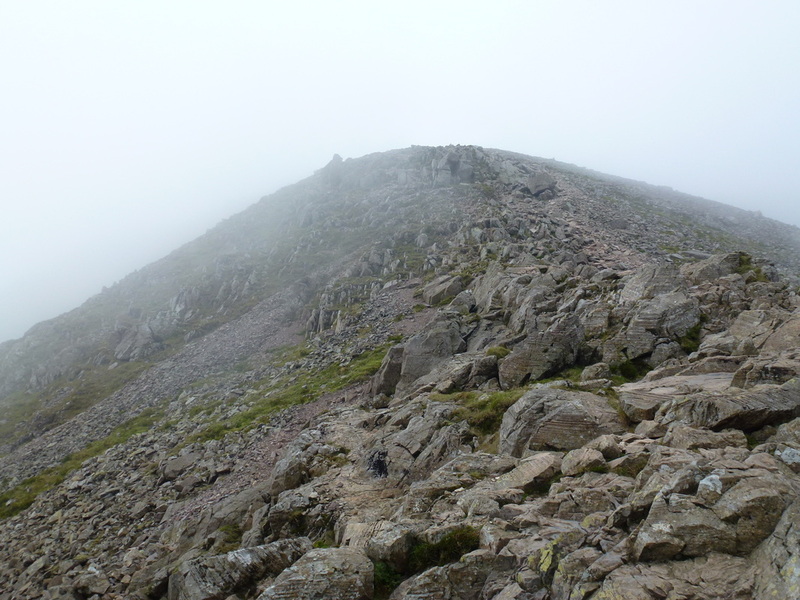 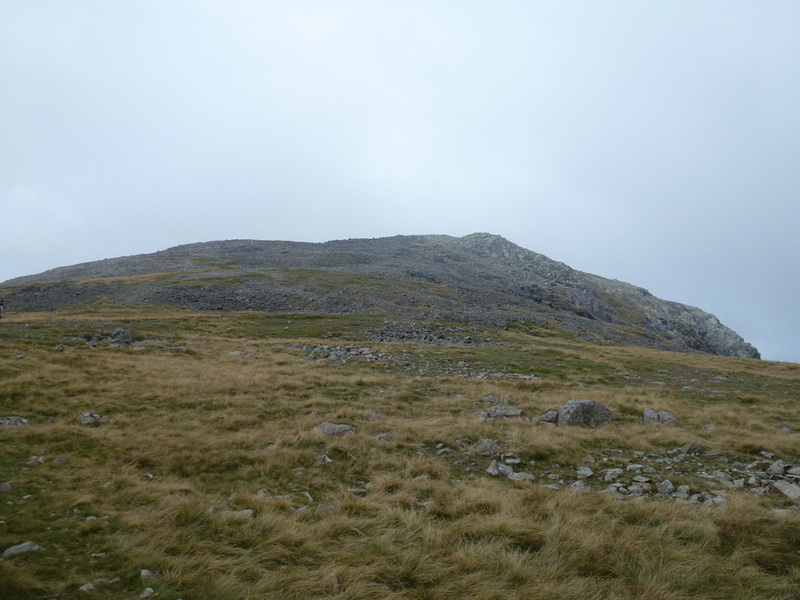 Once we were sure of our position we headed up the stony ascent to the summit and as we were almost there we were greeted with a break in the cloud as the neighboring summit of Scafell came into view to the right across Mickledore. 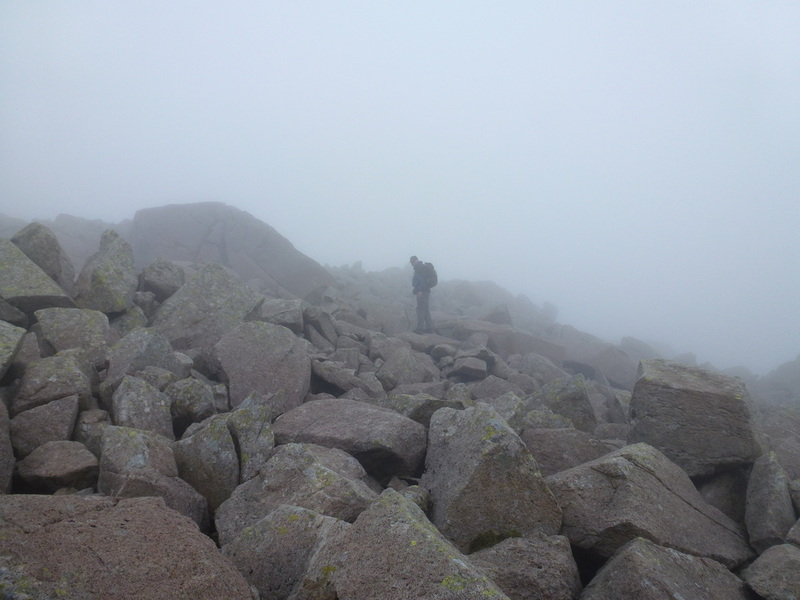 The summit is a sea of loose stone and large boulders therefore this needed careful negotiation before it was reached. 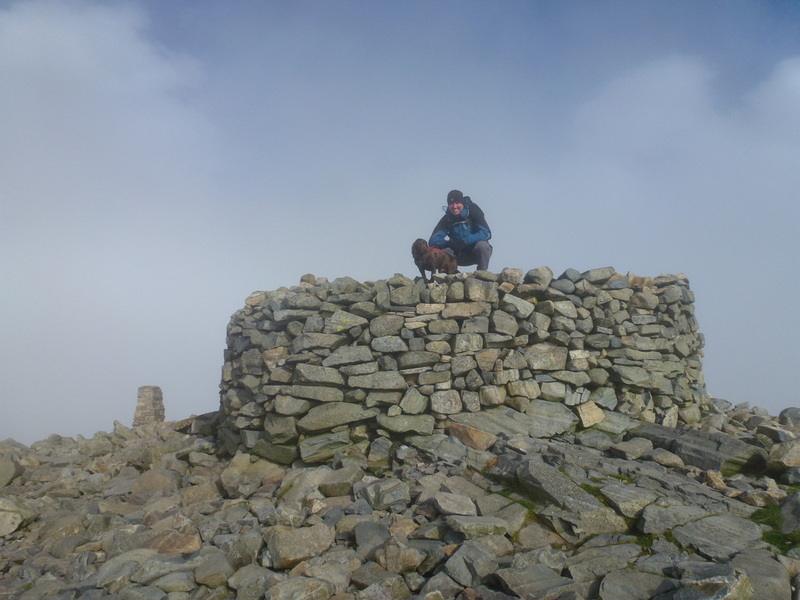 Arriving at the huge summit cairn and trig point we were the only ones there therefore we could take our time at the top. 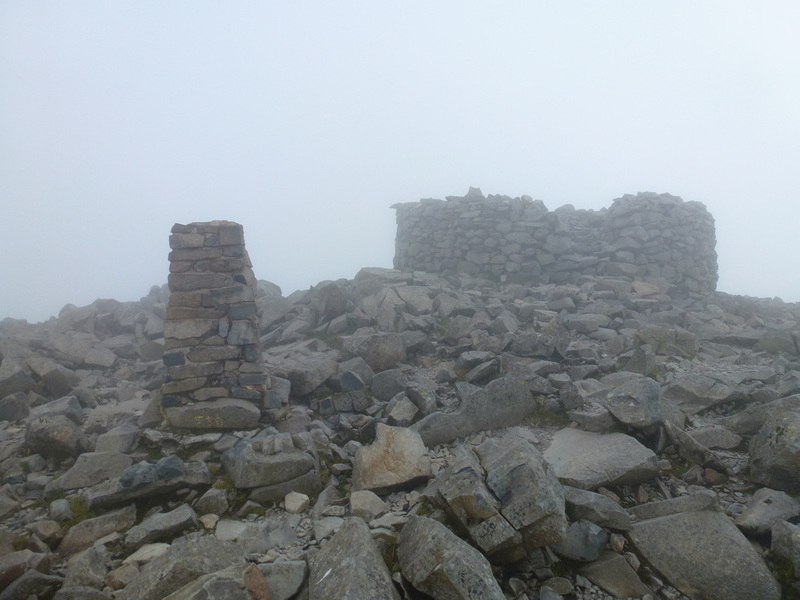 We had only seen 3 people all day therefore it was good to be able to be there without the crowds and summit hoggers. 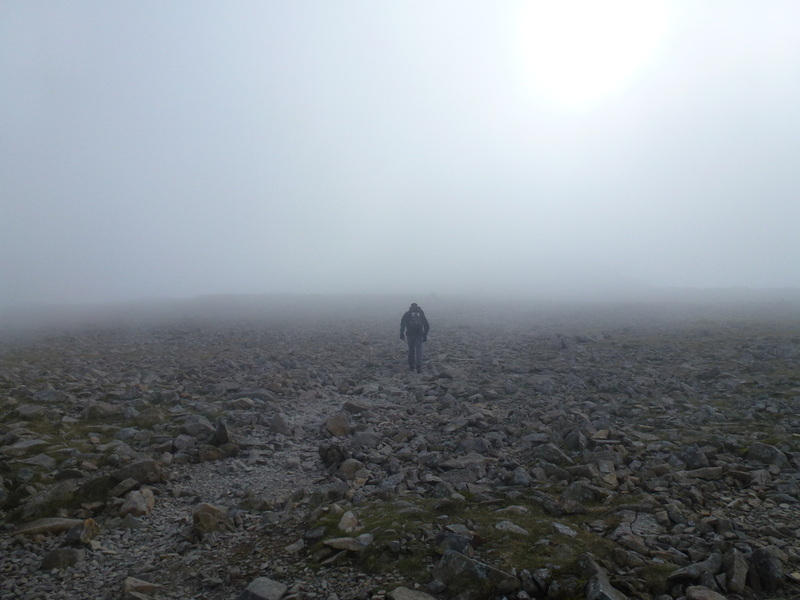 We had no views to speak of but this did not matter as we now had an excuse to come up here again! 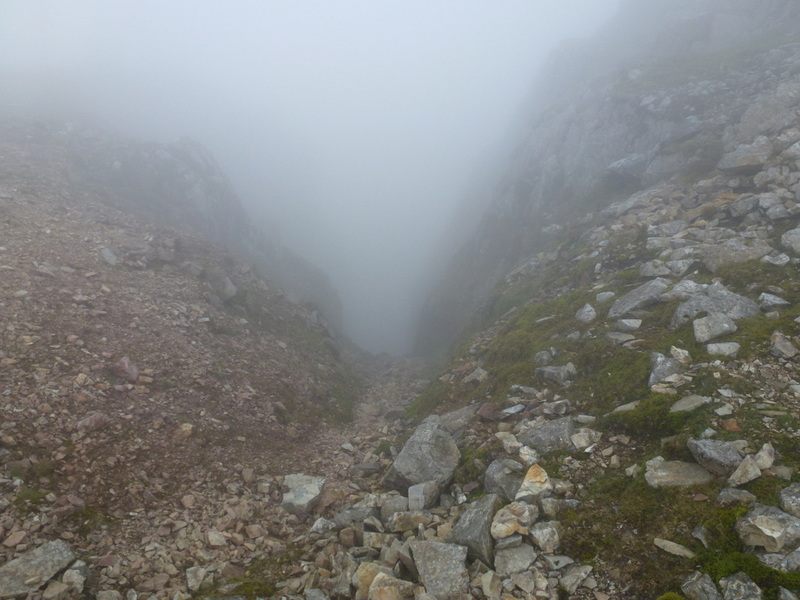 Photographs duly taken, the path to Broad Crag Col was easy to find and we made the precarious descent down to the bottom of the Col just as the mist was clearing - this gave us a glorious view down Little Narrowcove. 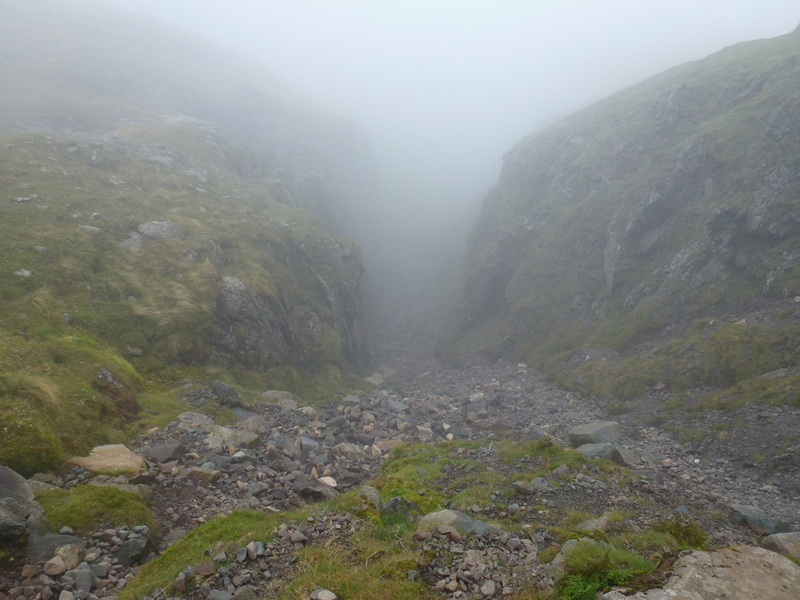 There then began a steep climb up Broad Crag in a claggy, horrible mist and it took several peers at the map and GPS to make sure we were on the right track. 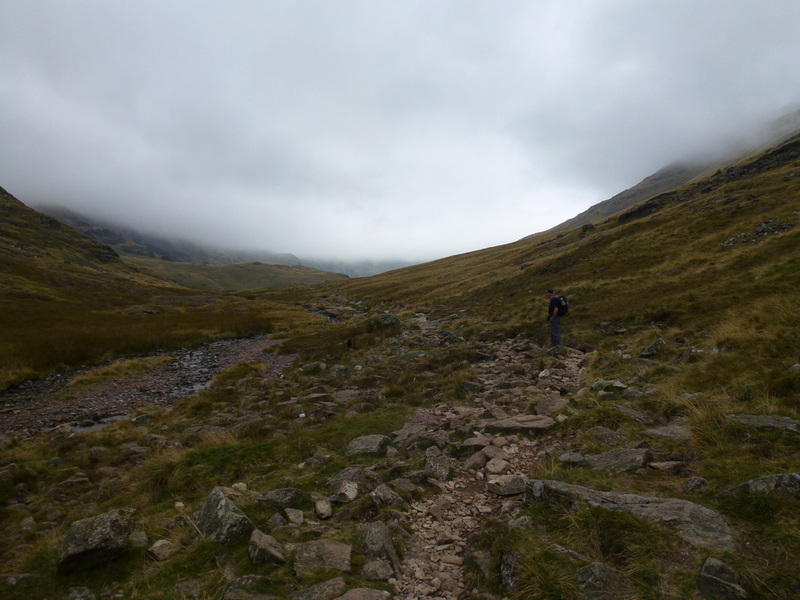 Once we had reached Broad Crag we made our way to the Esk Hause path and by this time the visibility had reduced to less than 15 yards which made for even more interesting navigation however the path is good therefore we were never in danger of erring off the route. 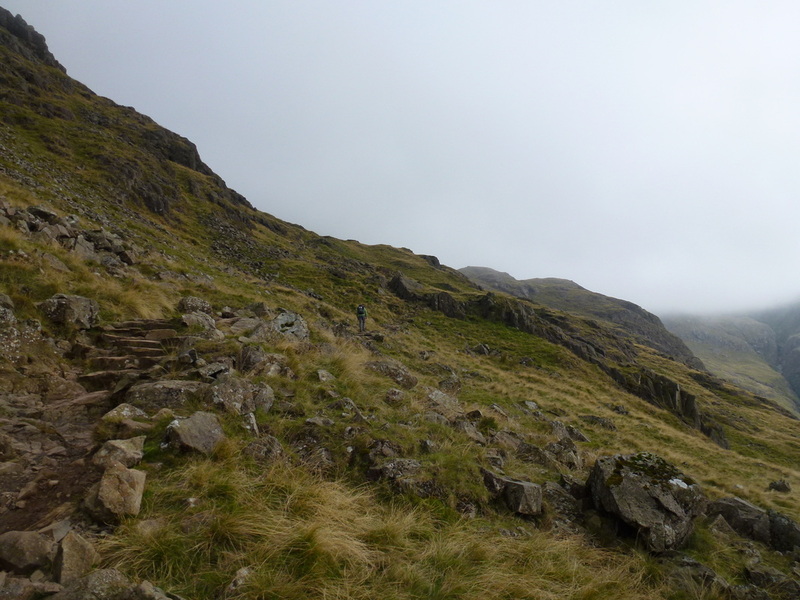 We reached the branch off path to Great End and were hoping that the viz would improve before we reached our 214th and final Wainwright. 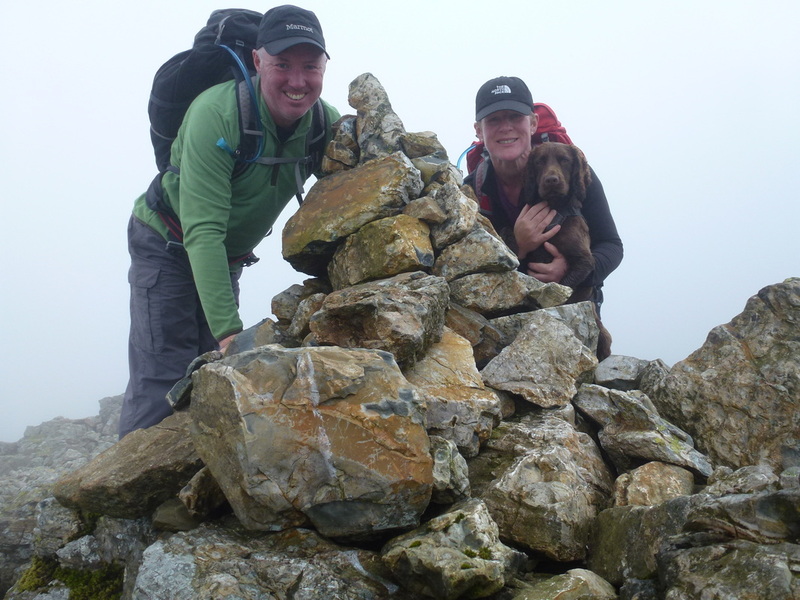 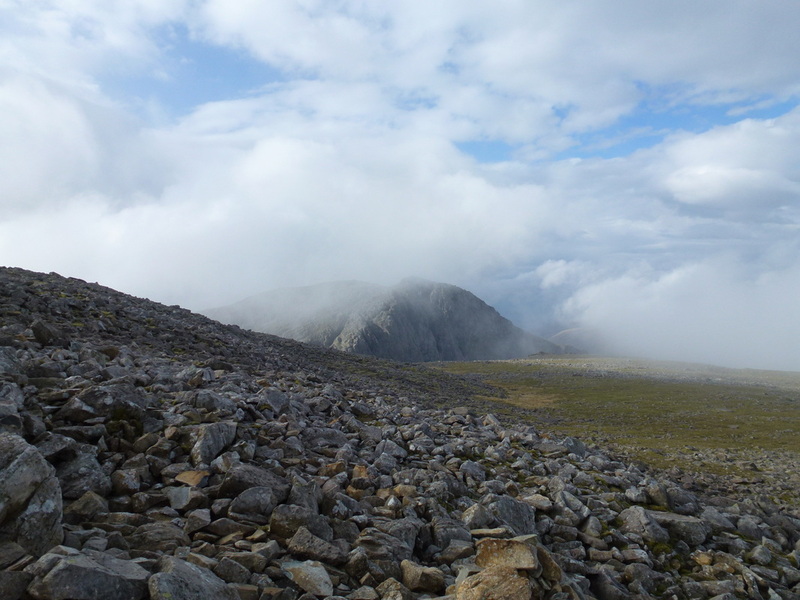 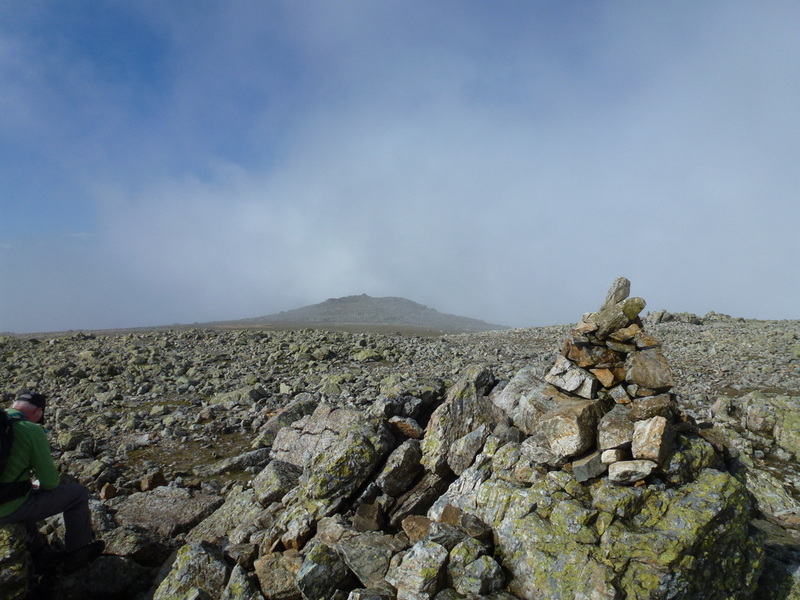 By the time we reached the top the mist was clearing and we had a great view over the summit where both cairns were seen clearly. 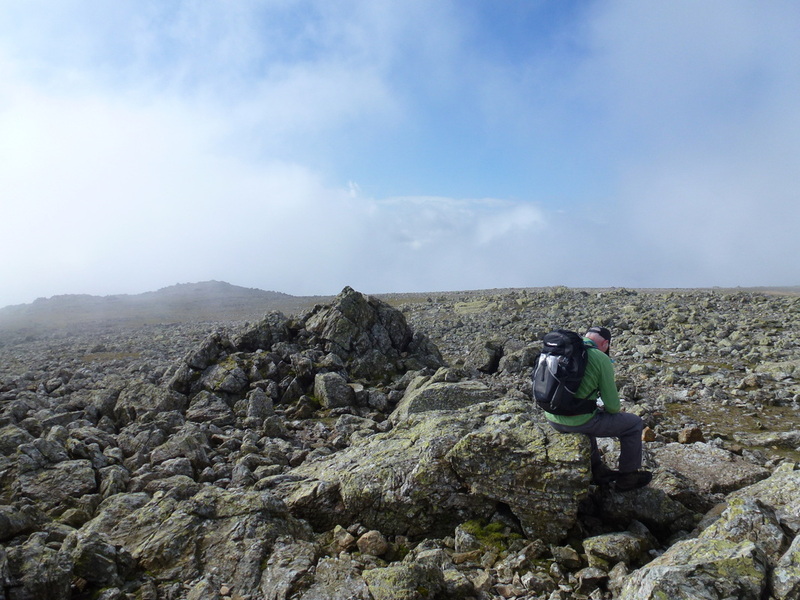 It was a great feeling to complete all 214 of these superb fells and we can now pick and choose to do our favourites again. 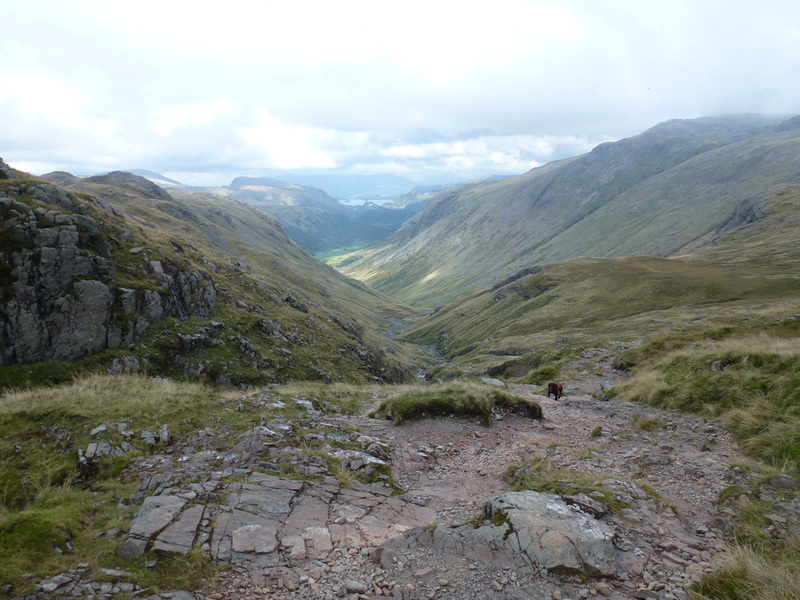 Leaving Great End, we picked our way down the fell to the large mountain pass of Esk Hause and took the left hand path to head for Sprinkling Tarn, which in turn would lead us to Ruddy Gill and ultimately the path down Grains Gill. 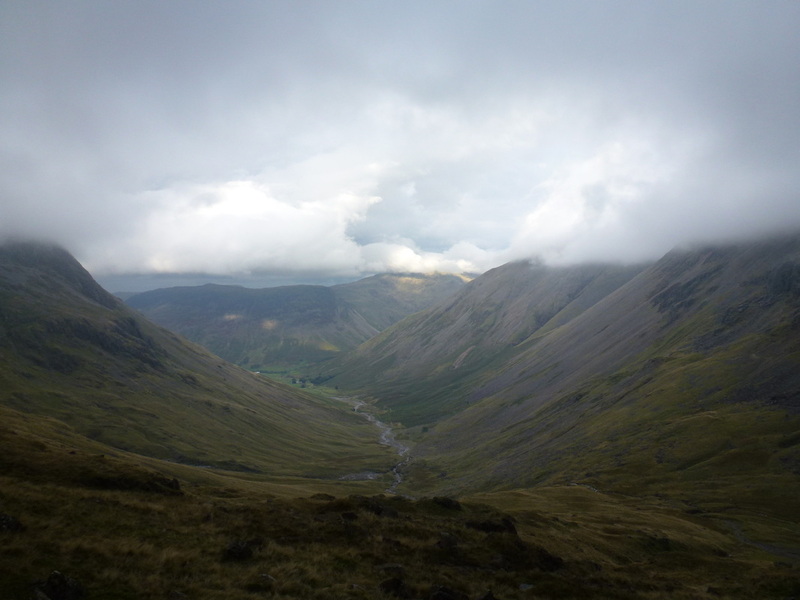 This is an exhilarating descent and the mist had cleared enough to give us views firstly over the Langdale Pikes and secondly over to Great Gable. 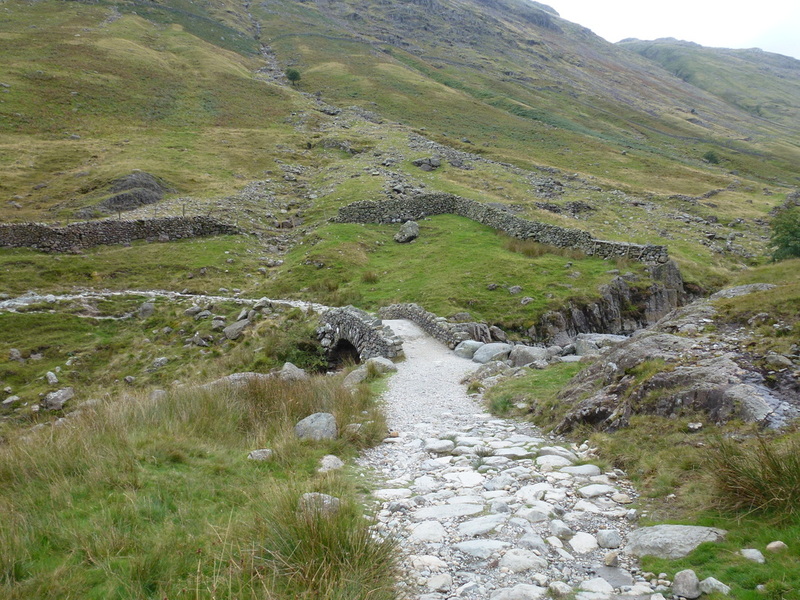 Reaching Stockley Bridge again, we made our way down the pleasant path back to the car at Seathwaite. 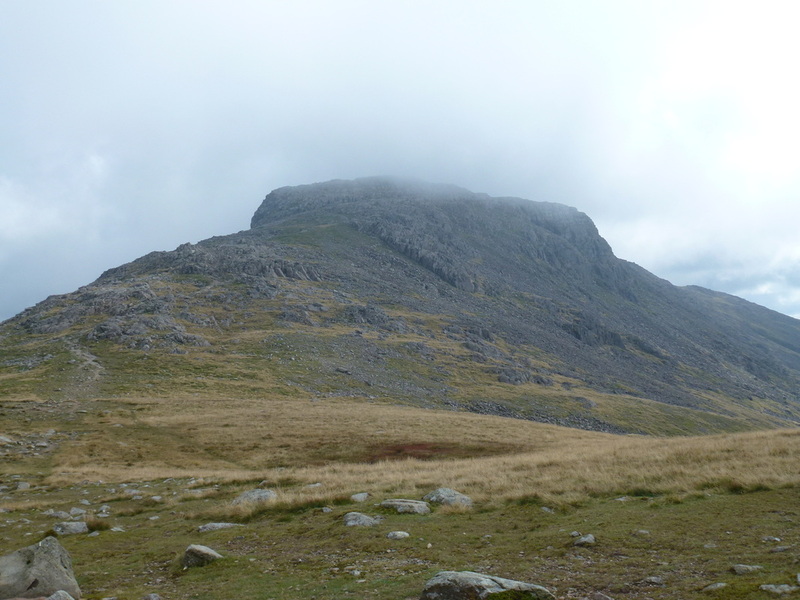 Despite the weather this was a fantastic walk, full of interest despite the cloud base being low for the majority of the day. 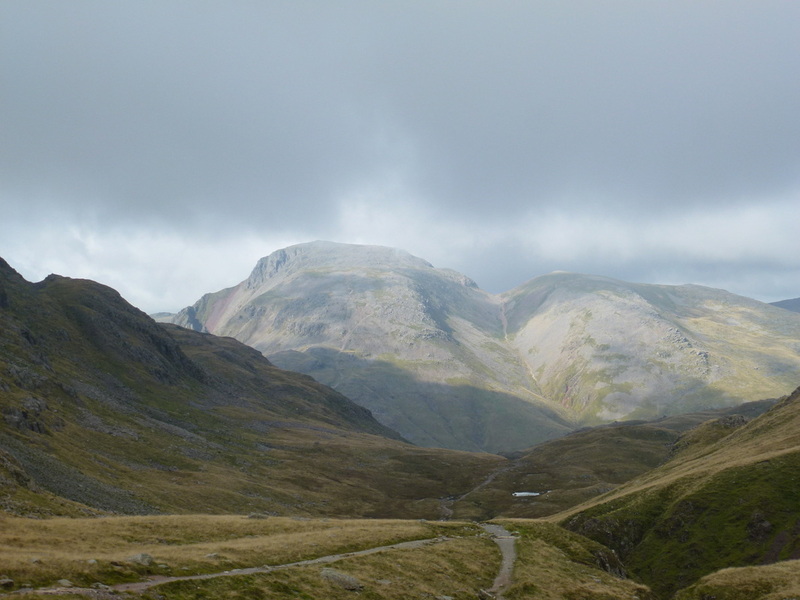 Leaving Esk Hause, Great Gable comes into view with Windy Gap and Green Gable to the right. 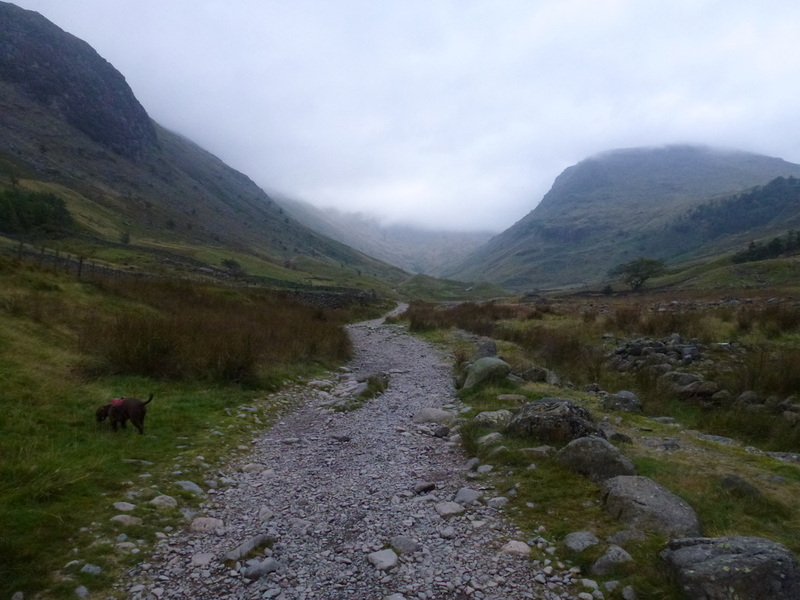 It wasn't wet today though!